Experiments using X-rays on two beamlines at the Australian Synchrotron have helped characterise a new class of single atom catalysts (SACs) supported on carbon nanotubes that exhibit outstanding electrochemical reduction of CO2 to CO. A weight loading of 20 wt% for the new class, nickel single atom nitrogen doped carbon nanotubes (NiSA-N-CNTs), is believed to be the highest metal loading for SACs reported to date. Single atoms of nickel, cobalt and iron were supported on nitrogen doped carbon nanotubes via a one-pot pyrolysis method and compared in the study. 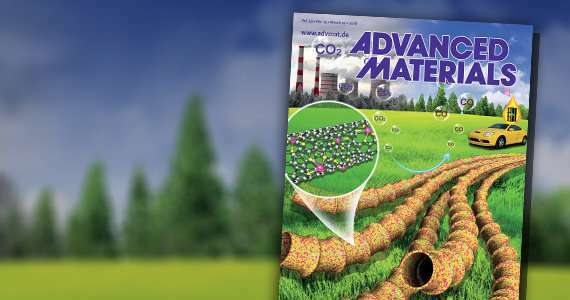 A large international collaboration, led by Prof San Ping Jiang, Deputy Director of the Fuels and Energy Technology Institute at the Curtin University of Technology and associates from the Department of Chemical Engineering, have developed a new synthesis and development process for nitrogen-doped carbon nanotubes with a nickel ligand that demonstrate high catalytic activity. The study was published in Advanced Materials and featured on the inside cover of the publication. Dr. Bernt Johannessen, instrument scientist on the X-ray absorption spectroscopy (XAS) beamline at the Australian Synchrotron was a co-author on the paper, which also included lead investigators from Curtin University of Technology and collaborators at the University of Western Australia, Institute of Metal Research (China), Oak Ridge National Laboratory (US), University of the Sunshine Coast, University of Queensland, Tsinghua University (China) and King Abdulaziz University (Saudi Arabia). Technical support and advice on the soft X-ray spectroscopy experiments was provided by Australian Synchrotron instrument scientist Dr. Bruce Cowie. "The whole idea behind the approach is that the smaller particles you have, the more catalytically active they are. As you go to a nanoparticle size, you see catalytic activity increase. And if you take that to the extreme, you are looking at single metal atoms anchored on a supporting substrate of carbon," said Johannessen. "Because surface atoms behave differently to bulk or other atoms, XAS was used to verify there were in fact single atoms and the position of those nickel atoms relative to other atoms. We were able to determine bond lengths and coordination numbers." The adding or subtracting single atoms from a particle opens up the possibility of tuning its properties. The challenge has been to keep the metal atoms, which provide a strong metal support bond, from interacting with each other and aggregating because of their higher surface energy. The investigators overcame this by developing a multistep method to synthesise atomically dispersed nickel atoms on nitrogen doped CNTs that included decomposing the precursor solution at high temperature. The X-ray absorption near edge structure spectroscopy (XANES) measurements at the Australian Synchrotron provided supporting evidence of the electrochemical efficiency of NiSA-N-CNTs. The results suggested that the Ni-N species are the active centres for the reduction reaction of CO2 to CO. The single nickel atoms are held by coordinating nitrogen atoms in the N- doped carbon nanotube structure and this helps stabilise the structure from metal aggregation. The NiSA-N-CNTs also demonstrated a higher turnover frequency than other nitrogen doped CNTs. The data confirmed there was no obvious aggregation or breakdown of nickel and also revealed the structural durability of the NiSA-N-CNTs as electrocatalysts. A number of other techniques and simulations were undertaken as part of materials characterisation and to confirm the CO2 reaction reduction. The new class of SACs has tremendous potential with promising applications in the areas of electrocatalysis and catalysts for energy conversion as well as other uses.